Advertising for Australia’s meat and livestock industry has been a colourful affair over the years. Two main players contribute to the ads battling for share of fork – Meat and Livestock Australia (MLA), which represents beef and lamb, and Australian Pork. Humour has played a prominent part in many of the executions launched by the pair, with parodies, music videos and irreverent rants keeping viewers entertained. In this Top10 Marketing takes a look at the best meat ads over the past few decades. Try not to get the meat sweats! 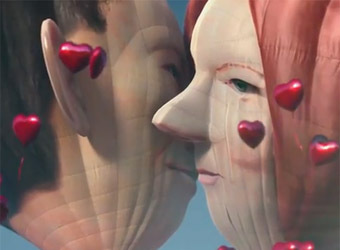 In this spot from MLA, hot air balloons in the shape of Prime Minister Julia Gillard and opposition leader Tony Abbott lock lips as they float above Parliament House. The campaign calls the cold months ‘Beefgiving Season’ and spreads the message that a little beef can warm up winter, and your relationships. If you can’t see this video, try refreshing your browser. In this campaign by Noble Brands Worldwide, Australian Pork takes on the dominance of the beef steak, by suggesting that the same portion of pork contains half the amount of fat. It’s a bid to improve health perceptions of pork and embed pork in the associations formed by the word steak. In this execution from a series of spots that promoted the health benefits and evolutionary roots of beef, actor Sam Neill gives us his best David Attenborough impersonation before dancing with an organutan. Red meat makes you smarter, Neill says, crediting it for the development of the human brain. Another parody, this time of music festival Woodstock. The execution shows hippies in a field passing around a lamb wrap as if it were a joint. This is a spot in a series of ads which plays on the innuendo behind the act of ‘porking’. In this execution, grandma proudly announces that she porks grandpa two to three times a week. This spot is the first iteration in the now long-running Sam Kekovic, Australia Day lamb series, which has seen the ex-AFL player address the nation each year since 2007. The ‘Lambassador’ and his irreverent tirades against ‘unAustralianism’ are now a mainstay in the Australia Day advertising schedule, helping to ingrain the meat in Australian culture. This year Kekovic went a step further, starring in his own ‘chop hit’ in an attempt to go viral on Australia Day. The music video parody of Aqua’s dance hit Barbie Girl in which the ex-AFL footballer raps was the third most viewed video when YouTube released its list of viral hits for the year to date in July. Lamb’s Australia’s fare. This spot shows two models cavorting through a field in a parody of a perfume commercial. Released in Australia as part of a Mother’s Day campaign for lamb, the TVC ends with the models sniffing a chop. One of the first times now-prominent Australia actress Naomi Watts appeared on our screens, this ad became part of the history of the Sunday roast. Watts turns down a dinner with then-‘it-boy’ Tom Cruise rather than missing a lamb roast with the family.